Tassal Ltd of huonville in Tasmania is on a list of stocks to be watched in 2007, according to The Weekend Australian. Tassal Salmon Farm in southern Tasmania. Tassal is highlighted because the Atlantic salmon that they farm, process and distribute is thought likely to become more and more popular among those seeking a healthy diet. Tassal operates from 18 marine sites on the west, east and north coasts of Tasmania. 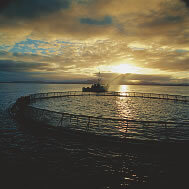 Tassal produces about 7,000 tonnes of salmon each year, one third of which is exported. Its turnover is more than $100 million per annum.